Of all the state QSO parties, CQP is by far the largest and most popular. Essentially, the CQP event is a world-wide contest - one of the reasons it is so popular. For 2010, CQP was active from 9:00 a.m. PDT on October 2 to 3:00 p.m. PDT on October 3, 2010. Unfortunately, the GPS had us lost at that time giving us no opportunity to partricipate. Ron (WQ6X) & George (N6GEO) operated as K6M from a small tent trailer on a private piece of land in Modoc county. 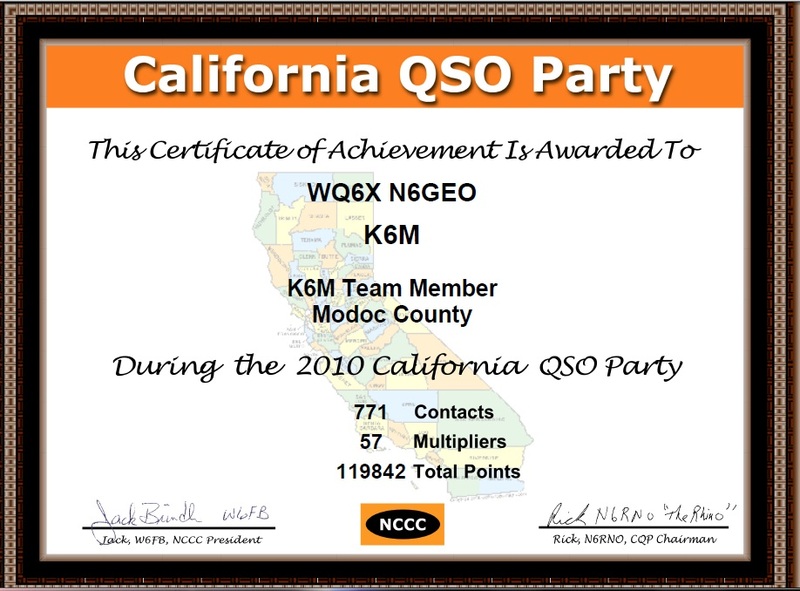 We were one of only 3 stations operating from Modoc. near Alturas in the S.W. corner of Modoc County. Click Here to view the CQP contest rules for 2010. Click Here to view the K6M proposed Band Plan for the 2010 Event. In CQP, amateurs from around the world endeavor to contact California amateurs on the standard radio bands from 160-meters (1.8 mhz) to 10-meters (28 mhz) as well as 6m (50 mhz) & 2m (144 mhz). Unfortunately, for CQP 2010, the Solar Flux hovered near 90 - less than a year into Solar Cycle 24. Here are two OP pictures along with the Score Totals from the 2010 CQP event. [Click Here] to view our 2011/2012/2013/2014/2015 Expeditions. George kept us alive on single sideband (SSB) and also on 40-m C.W. Here, George is making his presence known on 15-m sideband saturday afternoon. The classic Kenwood TS-120 and Kenwood tuner did the job. This picture was taken mid Saturday afternoon while I ran 20-Cw. The Elecraft K2 did an excellent job on Cw, front-ended with a Daiwa keyer. Somehow we crammed two operating setups on one tiny table.